Contact Us Today!Memorial benches are the perfect way to honor and remember teachers, students, family, employees, friends and family, and the legacy they left for the community. An engraved bench on a golf course is a great way to honor a golf partner. Or, you can designate or dedicate holes and yardages to them. Memorial park benches are an everlasting way to remember a family member or prominent member of the community. Our customizable memorial benches make impressive class gifts and can be an excellent fundraising opportunity for a school association, community organization, church and more. 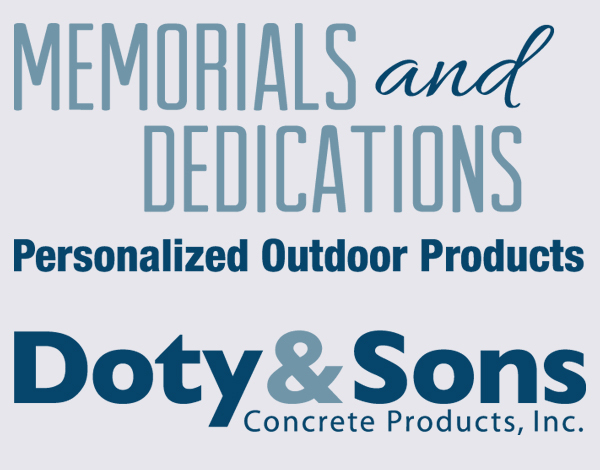 Memorial Products by Doty and Sons Concrete is committed to delivering high-quality products that are durable and resistant to weathering. We manufacture our memorial garden benches to withstand the harshest conditions. Interested in learning more about our memorial benches? Contact us today for more information.